Different options for different needs! Home stay with a local family: living with a host family puts you in a privileged & unique position to practice Spanish 24/7, and offers you an exceptional opportunity to experience the Latin culture, customs & way of life while studying Spanish in Bocas del Toro. Budget Hostels: the best hostels in Bocas del Toro within the low price range for budget travelers. Mid Range Hotels and Bed & Breakfasts: the best value and most convenient mid-range Bocas hotels. Luxury Hotels & Resorts: the finest top end hotels. Vacation Rentals: apartments, homes, cabins, villas & condos for rent for students who need more independence, or for families or friends traveling together that require several bedrooms. We cannot put enough emphasis on how important it is to choose appropriate accommodation during your Spanish course in Panama. Accommodation is an integral part of your language travel holiday. All of our accommodation options are carefully selected. 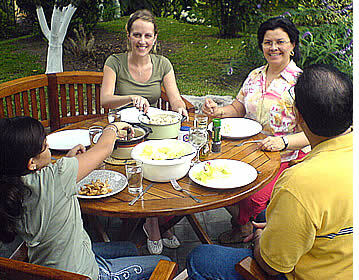 Each host family, hostel, hotel, bed & breakfast and apartment is approved and overseen by us. The quality is monitored by regular visits, phone calls and student feedback. Living with a Panamanian family during your Spanish course is an incredible cultural experience. A homestay offers you an amazing opportunity to practice Spanish in a natural, relaxed and authentic atmosphere as well as placing yourself in a unique and privileged position to get immersed in the Latin American culture, cuisine, customs and daily way of life. We have many different types of families and this allows us to choose the host family that best suits you. With our homestay program each student is given his own private room and can choose from having breakfast, half board (breakfast and dinner) or full board (three daily meals). Most of our host families in Bocas del Toro are within walking distance to our Spanish schools and very few of them are within a short ride using public transportation. Selecting the perfect family for each immersion student is the key to organizing a successful language immersion program. We ask every immersion student to carefully fill out an Immersion Pre-Program Interview that will help us choose the best family for their Total Spanish Immersion Program. It really helps to know more about you before choosing your host family. Low price range hotels will typically cost between $10 and $40 US Dollars per night, depending on the hostel and the time of the year. Accommodation and facilities are basic, but clean and welcoming. Shared and private options are available. The staff at our selected hostels provide a friendly and professional customer service. Hostels are a good option for travelers on a budget, backpackers and Spanish students seeking an environment with a young atmosphere and a chilled out energy. 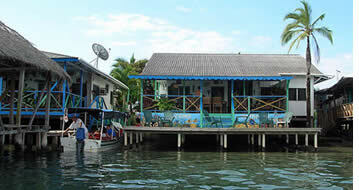 421 Guest House and Saigon Bay Bed & Breakfast are our favorite low budget hotels in Bocas del Toro. The prices given above for hotels are indicative and are the lowest prices available for each category. These prices are only for our students when they study with us for at least 1 week. However, prices do vary from hotel to hotel and we cannot guarantee that the hotels offering the rates listed above will always have vacancies. We will confirm availability and specific prices when we receive your application for your Spanish course. Boutique mid-price range hotels will cost between $30 and $100 US Dollars per night and will offer more privacy and facilities than the low range hotels. Rooms at the hotels of this category will be comfortably furnished and will include a private bathroom and cable TV as standard. Mid range hotels will also have breakfast and laundry service available for guests. Their facilities will offer free wireless internet connection, and nicer common areas. Santuarios del Mar, Bocas Island Condos, Hotel Tierra Verde and Hotel Cala Luna are our favorite mid-range hotels and bed & breakfasts in Bocas del Toro. Top price range hotels will cost between $65 and $300 US Dollars per night. The rooms themselves will be very comfortable indeed and the hotel will also offer a complete range of guest services that may include restaurants, bars, pools, spas, gyms and other facilities such as meeting rooms, business centers, etc. In this category you'll find Panama's most luxurious options and you'll certainly remember your stay at these special places wishing to return soon to enjoy a piece of heaven. Tropical Suites and Palma Royale are our favorite high end hotel in Bocas del Toro. Whether you just need a fully furnished 1 bedroom apartment or are looking for a 5 bedroom vacation villa, we are here to help you find the perfect place for your Spanish learning vacation! We also have a list of websites with classified ads and offerings of places to rent and for lease, and a list of real estate agents in Bocas del Toro. 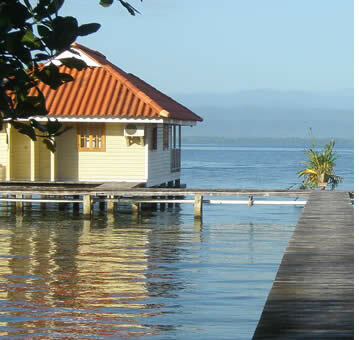 Santuarios del Mar, Bocas Bay Villa, Saigon Bay House, Bocas Beachfront Villas, Casa Caribbean Paradise and Bocas Island Condos are our favorite apartments and vacation rentals in Bocas del Toro. We will do our best to help you find a place to rent in Bocas del Toro, but we are not a real estate agent so we apologize if our "standard options" do not meet your specific needs or if we are not able to hunt down the perfect house for you. We will tell you about all the options that we know about and then help you secure the arrangement once you have made your decision. This service is ONLY available for Habla Ya students who sign for 1 month for at least 80 hours of Spanish lessons. 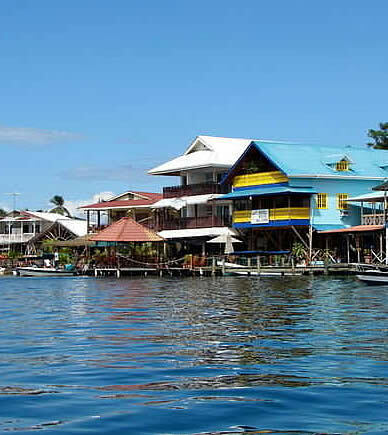 Where should you live in Bocas del Toro? We got the best option for you! Contact us!